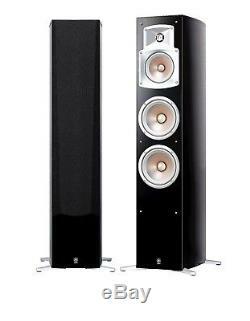 Yamaha NS-555BP EF-Series Floorstanding Speakers - Pairs - Black - HURRY LAST 4! 3-Way Bass-Reflex Tower Speaker System. The EF (Elliptical Form) Series feature Waveguide horns, PMD (Polymer-injected Mica Diaphragm) woofers and highest quality internal Monster Cable wiring for total enjoyment of digital movie sound and music sources, plus elegant Yamaha traditional piano finish cabinets. Dual 6.5 3-way Speakers. Sensitivity: 88 dB SPL/2.8V/m. Recommended Amplifier: 100 250 Watts. JOIN NOW FOR LATEST UPDATES & EXCLUSIVE OFFERS. The item "Yamaha NS-555BP EF-Series Floorstanding Speakers Pairs Black HURRY LAST 4" is in sale since Thursday, August 2, 2018. This item is in the category "Electronics\Home Audio Stereos, Components\Home Speakers & Subwoofers". The seller is "bestbuyonlinestore" and is located in Melbourne. This item can be shipped worldwide.